MIAMI (AP) – Rosa Salgado is a 79-year-old grandmother who's English was limited when she moved to Miami from her native Colombia in 1995. Despite her age and language difficulties, Salgado graduated from college with a degree in education on Saturday, the Miami Herald reported. 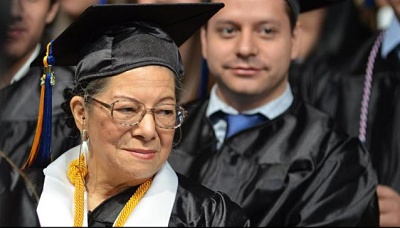 Salgado graduated from Miami Dade College's Wolfson campus along with two of her grandchildren. Salgado told the newspaper that graduating from college was the fulfillment of a lifelong dream. She graduated with honors. "My grandchildren, my family, they've grown up watching my activity and they are going to learn and fight in life and overcome obstacles," she said. One of her former professors, Sara Bulnes, said Salgado's grasp of English was limited — but her drive to learn was not. "When she came into my classroom her English was very limited and she struggled to learn the language, but she persevered," Bulnes said. "She had some personal setbacks and she beat them all and she's here graduating," Bulnes said. "I'm very proud of her." Salgado said she hopes to be an inspiration for others. "I would say to students, young, old or in the middle, that every day they have to fight to learn because learning is wonderful," she said.